Cornwall seems to be set apart from the rest of England, and The Lizard is another world within that world. Looking at a map of Cornwall, The Lizard comprises the lower part of a claw shaped end to the county, stretching out into the sea. The geology here is different and the inland terrain is flatter. Around 400 million years ago tectonic plate movement created some very interesting results, including the unusual serpentine rock found on The Lizard. It resembles dark green marble and is made into souvenirs for visitors. The difference in the geology has lent itself to rare and different plants. Their habitats have protective designations. But apparently the name Lizard has no connection to the reptile and is possibly a corruption of Cornish language, meaning ‘high court’. 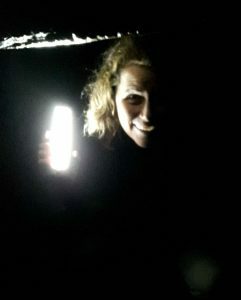 We really need to remember to bring a torch so that we can see inside Halliggye fogou. Fogou is the Cornish word for cave. Actually these caves are man-made tunnels of stone. No one knows for certain what they were for. But if in doubt go for ceremonial! Fogous are believed to be Iron Age c. 500 BC. Halliggye is great, big, dark and mysterious, and well worth a look. 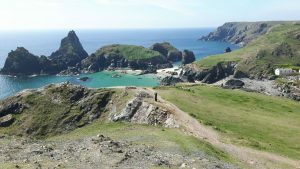 The Lizard also has some great beaches, Kynance Cove is the one you often see in pictures. Then there is Gunwalloe Cove, which is a Poldark filming location. There are also small fishing coves and the most westerly point in the UK, The Lizard Point, where there is a lighthouse and a National Trust wildlife watch-point. This is also where Marconi undertook his wireless telegraph experiments. As usual it’s a flexible tour based around your interests. 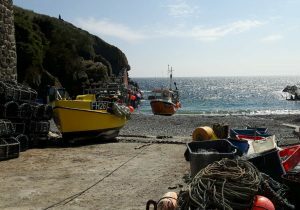 I really like to visit Cadgwith Cove for lunch. Kynance Cove is a steep hike. So we often just take a look from the cliff tops. Gunwalloe Cove is a must if you like Poldark. It’s the scene of smuggling operations! It’s exciting to go to Lizard Point to see if any wildlife can be spotted and it’s a lovely spot in itself and quite close to Kynance. 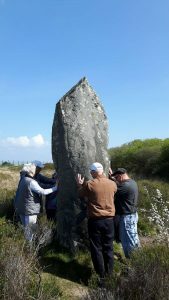 There are also standing stones that we can see. One of these sits on a nature reserve. It’s a pleasant walk to view it, spotting some of the flowering plants, insects and birds along the way. 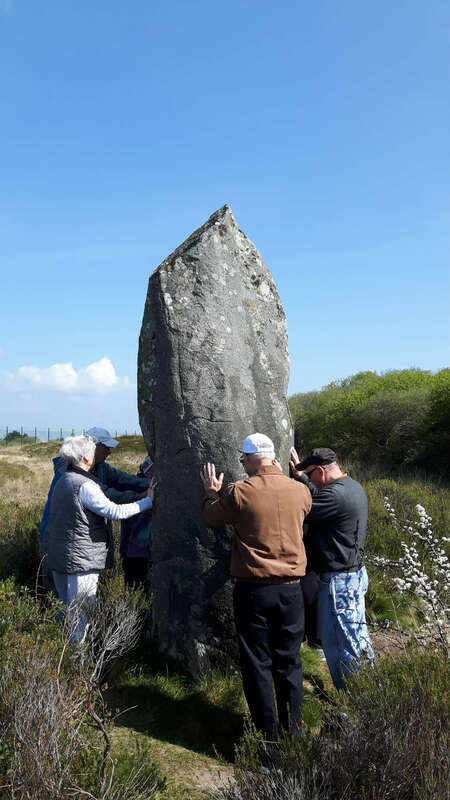 The standing stone or menhir monuments are Bronze Age, from the culture before the people who constructed the Fogou. I really like the churches of Cornwall, and there are several good ones on The Lizard. We should try to see at least one. St Mellanus at Mullion has a ‘dog door’ to allow the farmers’ sheep dogs to come and go during the service. There is now a thriving Cornish sea-salt business on the Lizard. I haven’t visited but it’s good to know! During the summer season, usually at the weekends, Bolenowe Animal Sanctuary is often open for tea. Please try to support them if you can. They care for a variety of animals, including some very lucky ponies who made it off Bodmin Moor in desperate condition and survived due to the care they were given here.